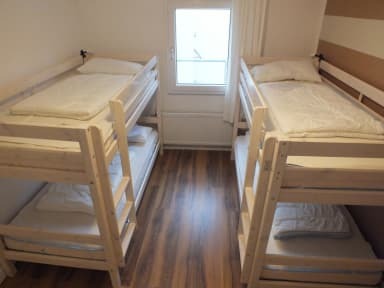 The hostel is at 2 to 5-minute walk from the tram, and from the city center with its pedestrian zone and the Rhine. We are at 300 m from Beethoven House. This property is set a short distance from attractions as Old Town Hall Bonn and Beethoven Monument. Opera Bonn is a 7 minutes’ walk away and Bonn Minster is 600 m from the hostel. The nearest airport is Cologne Bonn Airport, 16 km away from the property. Next to the hostel there is the collegiate church, built in 1886, which announces the time by bell. Within 3 to 5 minutes from the hostel there are the tram lines at the Bertha-von-Suttner Platz. The main train station is only 2 stops away from the tram stop. The World Conference Center, the UNO and the Museum Mile are 15 minutes away. There are many amenities nearby our hostel: pubs, a vegan snack bar, cafes, restaurants and a health food store. We offer nine different rooms on four floors from single to eight-bed rooms, housing a total of 30 people. Each shared room has a private bathroom with shower and a locker for each guest. 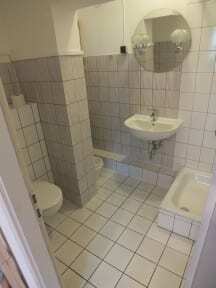 The two single rooms each have a sink in the room and have a common bathroom in the hallway. Reception: open from 8 am to 12pm and from 4pm to 8pm. Late-check-in possible outside check in time, 5.00 euros fees applied. You can leave the baggage before your check in or after check out (according to our opening hours). American Express Card not accepted.